Photo: Courtesy of Elle UK. 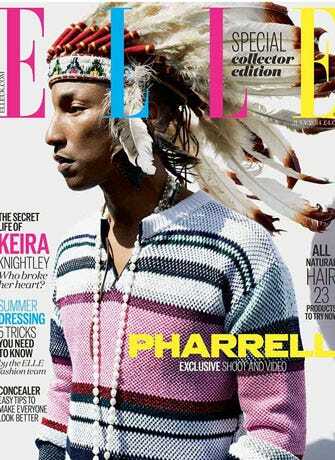 UPDATE: Pharrell has since decided to apologize, as Native American blogger Native Appropriations has pointed out. Here's a pretty straightforward test to determine whether what you are wearing is problematic: Are you on the cover of a fashion magazine with a symbol of someone else's culture? Then, yes, what you are wearing is a problem. A cursory read of the comments on the Elle UK website shows that no one thinks this is okay, even if it looks cool. And, to be completely fair, that's totally reasonable. We have been through this before. Everyone who works in media should know better. Pharrell should, for heaven's sake, know better. At this point, it's important to ask: Who hasn't engaged in the large, cacophonous conversation surrounding cultural appropriation? Assuming Pharrell, for some reason, has not (note: he has), almost all of fashion has. (Though, it should be noted, the industry has a long history of awkwardly borrowing from other cultures.) Anyone on the Internet has. If people in these businesses are still using these ham-fisted, immediately inflammatory images, then there is a major problem here. I have spent decades pushing the boundaries with my own personal style of dress, and I don't feel comfortable living in a world where what we wear is policed. Furthermore, the idea that someone can only wear the clothing of "their culture," negating the possibility of exploration or experimentation, is also a troubling one. After all, disrupting traditional signifiers, adding new context, or contrasting meanings is one of the most powerful and interesting things about fashion. But, there is a very real difference between exploring or experimenting with specific symbols in a conscious and intentional way — or even an artistic way — and just slapping on a headdress. It's the same reason people get upset when sombreros and ponchos are worn when someone is masquerading as a "Mexican" or why dressing up as a Geisha is pretty uncool. Here is all of a specific "other" culture being distilled down into one or two items of clothing. There goes an entire history, condensed and clumsily represented as both "exotic" and "object." Bottom line: There are 70 million billion things one can put on their head. Why the heck is Elle using one that will piss everyone off?